Ever since I bought a simple cotton canvas souvenir tote bag from the No Doubt concert, I haven't been able to stop using it! So much so that it's starting to get dirty and gross (from being stashed under the stroller, from having copious amounts of Cheerios shifting around, and from the little one's water bottle/sippy cup leaking all over the place!) and I fear too many washings will eventually ruin the artwork that made me fall in love with the tote in the first place. So what's a girl suppose to do? Make another tote of course! Even though it took over the span of 2 days to make it (the little one's nap time has been non-existent these past few weeks), if I were to add up the time it took it would equal to just under half an hour. I based the size off of my ND tote, since I like how it's small enough to not be overwhelming and yet big enough to hold a ton of goodies. At first it was going to be a simple and straight up canvas bag, but after some thought, I decided that route would be way too boring for my tastes. I'm sure you guys are sick and tired of seeing projects made with this fabric, but I pulled out the brown version of the Alexander Henry Apples and Pears fabric that I love oh so much. I contemplated using the pink color palette, but didn't like how starking white the background of the fabric was next to the beige canvas. The brown on the other hand, was accentuated by the natural coloring. I thought about cutting out a few of the apples and pear motifs and appliqueing them on, but that was too much work for my liking considering the time restraints. So I stuck with just sewing on a big strip of the fabric to one side of the tote. 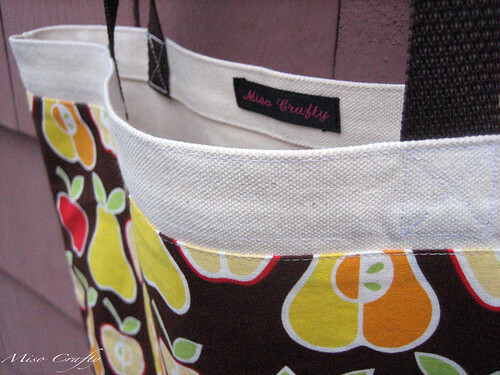 I didn't want to add the fabric to the other side of the bag cause I figured over time the decorative fabric could become thread-bare with wear, whereas the canvas can with hold extreme use with minimal damage. For some reason I have quite a few metres of brown polypro webbing sitting in my notions drawer. I can't remember why I had bought the stuff in the first place, but I'm not complaining cause it is perfect for this tote! I don't know why, but my favorite part of the bag is the sides of the bottom. Pure weirdness, I know. Such a small detail makes me happy! 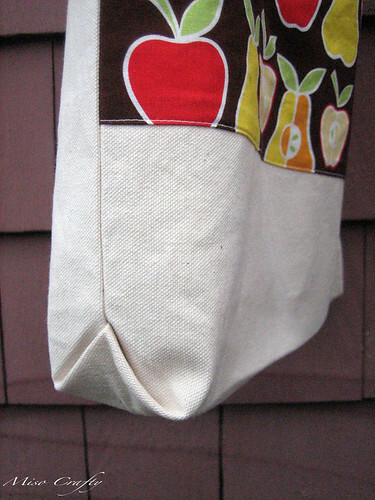 I'm thinking of making a tote out of linen and adding some cute buttons at the point, or even embroider little x's. Oohh...the possibilities for sheer cuteness is endless! 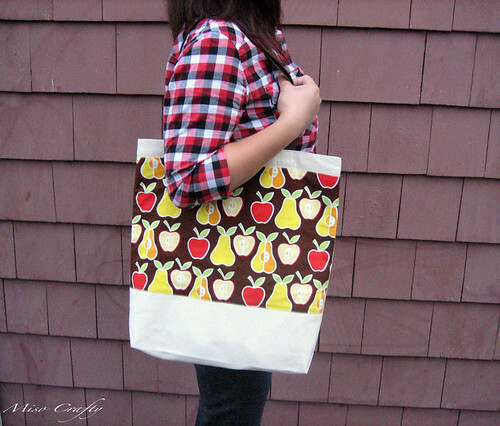 This is a great sized tote! I love making bags like this. They are so much cheaper than buying them and make a great alternative when shopping for plastic bags. I completely agree Kat! I've taken my tote everywhere and have yet to bring home a plastic bag of any kind, which is fantastic! 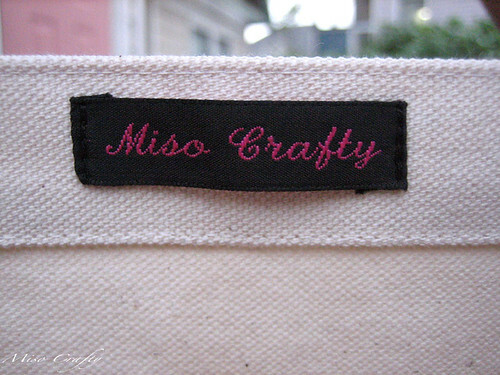 I'm already thinking of making a few more of these totes too now. On one of them I'm thinking of making the bottom a little bit bigger so that it can fit more groceries inside.